Hutchinson-Gilford progeria More Details syndrome (HGPS) is a rare premature ageing syndrome that is uniformly fatal and affects a variety of organ systems. Death in HGPS is caused primarily by myocardial infarction usually between ages 7 and 21 years as a result of rapidly progressive arteriosclerosis. Death is often preceded by hypertension, transient ischemic attacks and strokes. This case report of a child with HGPS is presented because of the rarity of this syndrome and the classical clinical findings that were observed. A 12-year-old girl, the youngest of three siblings, born of a nonconsanguineous marriage, and who had a normal perinatal history, was referred for evaluation of an incidentally detected cardiac murmur. There was failure to thrive but otherwise the patient was asymptomatic. There was no history of chest pain, syncope or palpitations. There was no family history of cardiac disease or genetic syndromes. The child had normal motor and mental development with normal intelligence. She had not attained menarche and her physical examination revealed short stature, craniofacial disproportion, shrunken facies, alopecia, prominent scalp veins, prominent eyes, micrognathia, a "beaked" nose, prominent and stiff joints, dystrophic nails, thin wrinkled skin and absent secondary sexual characteristics suggestive of a premature ageing syndrome [Figure 1] and [Figure 2]. The above-mentioned abnormal features were noted to appear after infancy. The blood pressure was 128/92 mmHg, and all pulses were palpable, but feeble. There was bilateral carotid shudder. There was no brachiofemoral delay and clinical findings suggestive of severe aortic stenosis were present. Electrocardiography revealed left ventricular hypertrophy with a strain pattern. 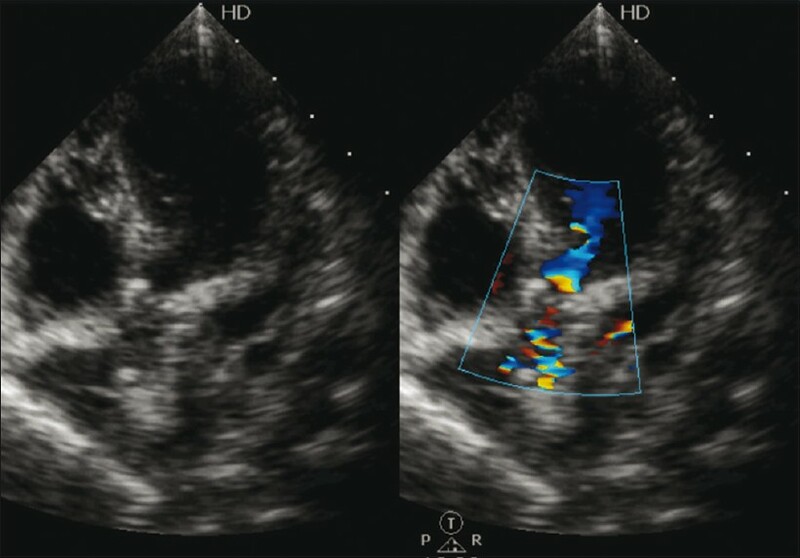 Echocardiography showed calcified aortic cusps with severe aortic stenosis (peak systolic gradient of 72 mmHg, mean gradient of 52 mmHg), mild aortic regurgitation and moderate mitral regurgitation [Figure 3]. There was concentric left ventricular hypertrophy with normal function (ejection fraction 57%). The aortic valve area was estimated to be 0.7 cm 2 . The patient's lipid profile revealed hypercholesterolemia with elevated low-density lipoprotein cholesterol and normal high-density lipoprotein cholesterol. It was decided to manage the patient conservatively as the outcome of aortic valve balloon dilatation/surgical replacement in this condition is not well documented and also because of the extremely fragile general condition of the patient. HGPS has long been a source of fascination and curiosity. Since its first description, about 100 cases have been documented worldwide. HGPS is characterized by features reminiscent of normal ageing such as alopecia, skin wrinkling and osteoporosis. The most devastating aspect of this disease, however, is accelerated, premature cardiovascular disease that leads to fatal myocardial infarction or stroke by an average age of 13 years. It is caused by a single base mutation in the LMNA gene, a laminopathy, which results in the production of a mutant lamin A protein product, progerin. ,, Laminin A is an essential scaffolding component of the nuclear envelope, which is the membrane that surrounds the nucleus. The altered protein in HGPS makes the nuclear envelope unstable and progressively damages the nucleus, making cells more likely to die prematurely. The diagnosis of HGPS is essentially clinical,  as in the present patient, although other diseases may phenotypically mimic HGPS early in life (i.e., Wiedemann-Rautenstrauch syndrome More Details and restrictive dermopathy). The characteristic features are usually recognized during the second year of life. Most of the signs and symptoms, as well as the cause of death, result from the complications of sclerosis. In conclusion Hutchinson-Gilford progeria is a rare disease characterized by accelerated signs of ageing.that result from mutation in lMNA gene. Cardiovascular involvement is the commonest cause of death and prognosis remains poor. 1. Hennekam RC. 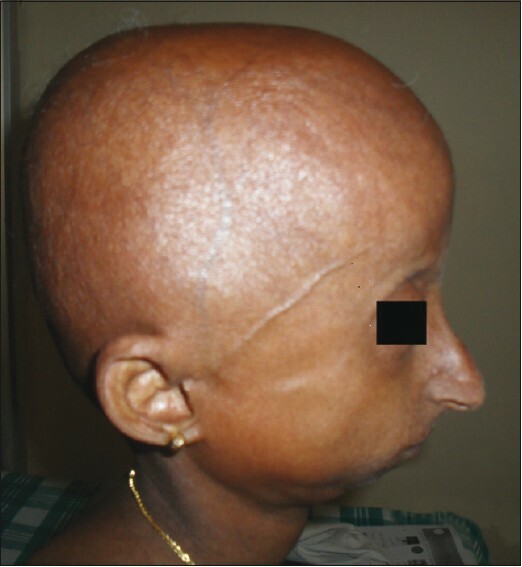 Hutchinson-Gilford progeria syndrome: Review of the phenotype. Am J Med Genet A 2006;140:2603-24. 2. DeBusk FL. The Hutchinson-Gilford progeria syndrome: Report of 4 cases and review of the literature. J Pediatr 1972;80:697-724. 3. De Sandre-Giovannoli A, Bernard R, Cau P, Navarro C, Amiel J, Boccaccio I, et al. Lamin A truncation in Hutchinson-Gilford progeria. Science 2003;300:2055. 4. Badame AJ. Progeria. Arch Dermatol 1989;125:540-4. 5. Csoka AB, Cao H, Sammak PJ, Constantinescu D, Schatten GP, Hegele RA. Novel lamin A/C gene (LMNA) mutations in atypical progeroid syndromes. J Med Genet 2004;41:304-8. 6. Nair K, Ramachandran P, Krishnamoorthy KM, Dora S, Achuthan TJ. Hutchinson-Gilford progeria syndrome with severe calcific aortic valve stenosis and calcific mitral valve. J Heart Valve Dis 2004;13:866-9. 7. Makous N, Friedman S, Yakovac W, Maris EP. Cardiovascular manifestations in progeria. Report of clinical and pathologic findings in a patient with severe arteriosclerotic heart disease and aortic stenosis. Am Heart J 1962;64:334-46. 8. Merideth MA, Gordon LB, Clauss S, Sachdev V, Smith AC, Perry MB, et al. Phenotype and course of Hutchinson-Gilford progeria syndrome. N Engl J Med 2008;358:592-604. 9. Ishili T. Progeria: Autopsy report of one case, with a review of pathologic findings reported in the literature. J Am Geriatr Soc 1976;24:193-202. Kane, M.S. and Lindsay, M.E. and Judge, D.P. and Barrowman, J. and Ap Rhys, C. and Simonson, L. and Dietz, H.C. and Michaelis, S.
Villa-Bellosta, R. and Rivera-Torres, J. and Osorio, F.G. and AcÃ­n-PÃ©rez, R. and Enriquez, J.A. and LÃ³pez-OtÃ­n, C. and AndrÃ©s, V.
Kiraz, A., Ozen, S., Tubas, F., Usta, Y., Aldemir, O., Alanay, Y.